TWF is seeking to contract with a part-time Watershed Conservationist to recruit farmers, provide technical assistance, assist with cost-share applications, connect with partners for additional funding options, and oversee project implementation. Do you, or anyone you know fit the description below? We’d love to talk with you – email Lyn@WatershedFoundation.org. 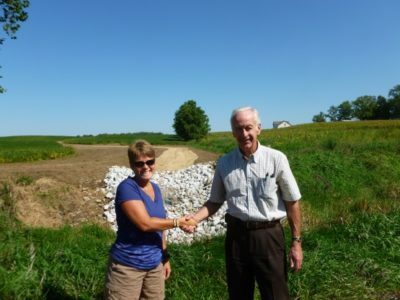 The Watershed Conservationist shall identify and secure landowners/project sites to participate in TWF and Kosciusko County SWCD’s various cost-share programs. Conservationist will advertise and target landowners for implementation of specific BMPs based on the Watershed Management Plan (WMP) priority areas and pollutants of concern in those areas. The liaison will provide BMP advice and consultation to landowners. The Watershed Conservationist will work with TWF, Conservation Partnership staff, and consultants to ensure adequate designs and consistent, regular communication with landowners. Identify landowners willing to participate in the BMP cost-share program. Assist with targeted marketing or mailings to key landowners or groups. Meet with land users to encourage continued pursuit of conservation efforts, implementation of planned practices, and proper maintenance of previously applied practices. Keep accurate records of names and dates of landowners contacted. Prepare necessary cost-share application and ranking paperwork. Assist in the preparation of technical reports and documents for submittal to IDEM, LARE, CWI or other funding agencies and organizations. Provide regular updates to the TWF and SWCDs about status of projects and efforts. Work closely with regional partners to efficiently accomplish workload throughout the watershed. Maintain close working relations with personnel of local SWCDs, USDA Natural Resources Conservation Service (NRCS), Purdue University Cooperative Extension Service, Indiana Department of Environmental Management, U.S. Army Corps of Engineers, and other federal, state, and local agencies and organizations. Assist with planning and implementation of agricultural field days and/or workshops. Track number of participants and contacts at such events. Assist with interpretation and public education/information about BMP cost-share projects. Attend the TWF technical/watershed committee meetings throughout contract. Attend training and conferences as necessary. Ask Lyn: What is TWF Planning in 2019? Clear Choices Pledge of the Month – Volunteer Service!